Making the right use of natural light is one of the biggest concerns of an interior designer in a bathroom, so if you're working on the project on your own, you can dramatically improve the look of your washroom with lighter paint colors, according to Better Homes and Gardens. Unless you're going for a strikingly modern aesthetic, softer paint hues like pastels and other warm neutrals are ideal for bathrooms big and small. Since many bathroom accessories and appliances are typically white, a brighter hue can help to break up the action in the space and give you an inspiring backdrop to work with. With a lighter backdrop, you can also use darker shades of the same hue in the form of towels, bath mats and other accents to add a bit of contrast to your space. For instance, if you're using a pale green in your bathroom, counteract the look with forest green pieces of decor to stay within your chosen theme and provide a bit of visual interest. These refreshing colors can breathe new life into your bathroom and keep it looking stylish for years after your project is completed. 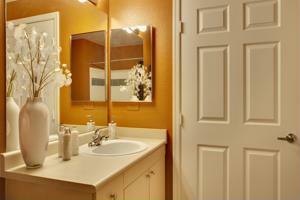 Which light paint hues are your ideal choices in a washroom?